Just what was He thinking when He shook the earth? 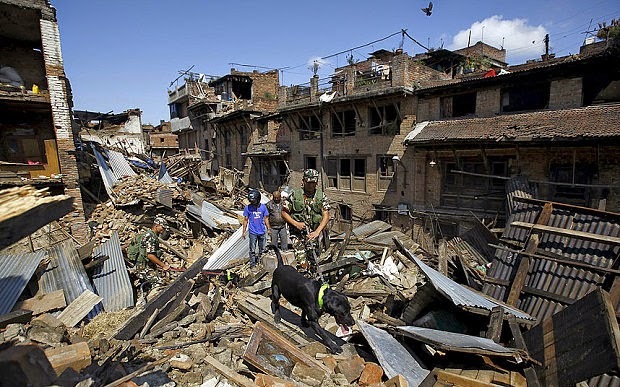 The recent Nepal tragedy has set me thinking again, not that I ever stopped doing that! But on a serious note, it set me on the path of stuff like faith, belief in god and such. A newspaper article mentioned about a person, who had organised a ritual ‘saptahik pooja’ in the local parlance, on the fateful day, in Nepal. About 52 close family members had gathered for this religious ritual, of which only 9 have survived the earthquake! The 25-year old moans the death of more than 40 relatives, an entire generation, including his grandfather, his mother, all her sisters, his brother, and many others. According to him “....we were conducting the pooja to make the gods happy, they instead gave us their wrath.” Not surprisingly, he has lost faith in god. (Times of India, dt. 29/4/15, Mumbai edition). My god believing (or was it ‘fearing’?) mother tried her level best to instil some semblance of faith in god in me and did manage to succeed till I learnt to question; questions based on the tenets of rationality at an age when questions were natural. My mother would always justify tragedies with different words like destiny, karma, actions of the past life, etc. without much help though! Neither my mother, nor anybody could help much and questions gathered in tonnes while answers were scarce. With a growing scepticism towards god/faith and at an age when it was both natural (as well as fashionable), I only moved away from the ‘idea of god’ in the traditional sense. When I read about instances like that of the Nepali youngster mentioned earlier, I only end up revisiting the same questions again. Faith, destiny, karma, actions of the past life, etc. haunt me with the same vigour as they did since the time my religious mom explained to me the causes of tragedies, both personal as well as common ones. Are these for real I wonder? Are these answers or escapism? Are these efforts to explain the unexplainable or simply make silly efforts to justify the presence of god and instil fearfulness in the gullible? This takes me back to my childhood days, when the efforts of my mom met with the efforts of my English teacher, who taught me Abou Ben Adhem, by Leigh Hunt (For the full poem - http://www.poetryfoundation.org/poem/173698). While I might not have quite comprehended the poem, when it was taught to me (Std V), it did leave a lasting impression on me, the impact of which was realised much later in life. According to this poem, when Abou learns that his name is not in the list of people who love god, he requested that his name be added in the list of people who love their fellow men. Next day, he learns that his name leads the names of all those people whom God loves! While no angel has as yet showed me any list of this kind, and I am no Abou, this poem, for me, generates immense faith in mankind. When I read about people who perform selfless service, or jump to death to save some children or people, it gives me a lot of assurance that faith in humanity is a lot more rewarding. People who risk their lives in the face of adversities of different kinds, or save hundreds, without caring for their lives, be it the unknown jawan in the army, or a 10-year old who scares a tiger away, or a girl who braves the extremists to go to school and ends up with a bullet in her head, I feel much assured by mankind. If nothing, I can repose my faith in man, who is visible and understandable, than the god, who is unfathomable. Why else would he retain his house and reduce that of the humans to rubble? At the end of the day, my faith in humanity is restored, however, can’t say how further I am from divinity! So whatever he was thinking when he shook the earth, Mankind will triumph in the face of all adversities. Trust me, for I ain’t god! This is a story that is part of the oral narrative traditions of the Kunknas, who have their own version of Ramayan. The Kunknas are a coastal tribe found in an area called Dangs which is a region located on the borders of South Gujarat & Maharashtra, states of India. Many of them speak a dialect known as Dangi, which is a mix of languages, namely Gujarati, Marathi and a bit of Hindi. The Kunkna Ramayan starts with the story of Ravan and explores the life and times of the demon king for a significant part of the epic. The story goes that once there was a king, who had seven sons. Though he was a King he lived like an ordinary man and worked hard for a living. Out of the seven sons, six were able bodied, but the youngest one had no arms and legs, just the torso and a head. His name was Ravan. Ravan could do very little by himself. So all day, he would lie in a corner and depend on his siblings and parents for almost every task that he had to undertake. Soon the six sons grew up and were married. While they did continue to take care of Ravan, they were beginning to get tired of looking after him. One day the six brothers and their wives decided to throw him out of the house and asked him to take care of himself. Ravan pleaded and cried, but the brothers threw him out saying that Mahadeo, their Lord must have decided his fate such, and who were they to interfere with his justice? If he wanted justice then he might as well go and approach Mahadeo. Ravan had no choice and so tumbling and turning, he crossed fields and jungles and reached the shrine of Mahadeo. Bleeding and bruised, he started his penance. After about six months, Mahadeo who had seen everything and was impressed by Ravan’s ability to survive despite all odds, appeared before him and asked him to seek a boon. Ravan said that all he wanted was legs and arms. Mahadeo took him to his abode and asked him to rest for the night. Next day, Mahadeo told Ravan that he had to visit Earth to feed the birds and bees and that he should wait until evening when he would be back. Before leaving, Mahadeo warned him not to enter a particular room, as that would bring him trouble. Ravan felt slighted. He was sad that Mahadeo cared less for him than he did for his birds and bees. He felt that there was no one in the entire universe that wanted him and life was not worth living anymore. Ravan decided to end his life. He pushed open the door that Mahadeo had asked him to leave alone and entered the forbidden room. But before he could take a look around him, he felt himself falling down a well. He was drowning and in order to survive, he swallowed water from the well, one, two, three....nine mouthfuls. And no sooner had he done that, there sprang nine heads on this shoulders, nine arms on each of his sides and two legs. Ravan was shocked at this development. But he managed to pull himself out of the well and out of the room. He came out to find Mahadeo waiting for him. Ravan appealed to him for help, but Mahadeo threw his hands up in despair. 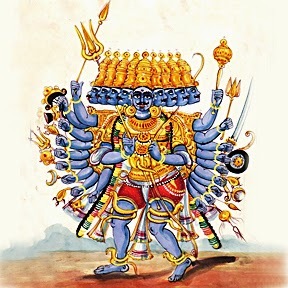 He expressed his inability to do anything, since Ravan had drunk the water from the well of life which had given him all those heads and arms. Ravan didn’t know what to do. He was worried, who would give him work? Sorry for him Mahadeo said, that he would give him a piece of land called Lanka and he could rule that place. Ravan accepted the offer since there seemed to be nothing else that Mahadeo could do. While leaving the abode of Mahadeo, Ravan saw Parvati climbing the stairs with a pot of water. Ravan again approached Mahadeo and said that since he had agreed to give him whatever he had asked for, he wanted Parvati for a wife, as he would never get any woman to marry him. Mahadeo reluctantly gave him Parvati. Ravan rushed to his land with Parvati closely following him. All this was being observed by the assembly of the gods in Dwarka. Narandev, decided to intervene. He took the form of a local tribal and placed himself on the path that Ravan would take with an old buffalo. Ravan saw him pushing the buffalo and as he came closer, Narandev asked for help. On enquiring, Narandev said that the buffalo was a gift from Mahadeo, whom he had been serving for long, but as usual he had been cheated. The buffalo was old and useless. When Narandev learnt that the woman with Ravan was Parvati, Narandev told him, that he had been visiting Mahadeo for many years and he knew this wasn’t Parvati, but some maid, while Mahadeo’s wife was very beautiful. He should go back and check. A furious Ravan, fell for Narandev’s words and decided to go back. Narandev in the meanwhile picked up a frog from the lake and changed it into a beautiful lady and took her to Mahadeo’s abode. On reaching there, he explained everything to Mahadeo and told him to hand over the woman when Ravan asked for her. But things did not go as smoothly as expected. One glance from Mahadeo made the frog woman conceive. She waspregnant. When Ravan came, he saw the woman standing who was better dressed and more beautiful than the one he had taken along. So he asked for the woman and returned Parvati. Mahadeo did as advised and Ravan decided to leave with the woman. On the way, they decided to take some rest. Ravan laid his head on the lap of the woman and went off to sleep. The woman meanwhile was drawn towards a few frogs frolicking in the nearby lake. She decided to join them. She folded her saree neatly into tiny layers, kept it under Ravan’s head and joined the other frogs in the lake. When Ravan woke up and didn’t find the woman, he shouted in anger. The loud voice of Ravan shook the earth and created ripples in the water of the lake. The sound of his voice unnerved the woman and in fear, she aborted her foetus which fell out of her womb and was carried away in the waters. When she explained everything to Ravan, he didn’t pay much attention to her and decided to move on. And as the Kunkna Ramayan goes on to reveal, the foetus was later found in one of the nearby fields and the baby grew up to be Sita! In the previous part we read about Jason’s voyage to Colchis and how with the help of Medea he gets the Golden Fleece, but in the process, Medea loses her family. After they reach Colchis, Pelias is killed by his daughters after they are tricked by Medea, but have to leave Colchis too. Euripides’s play “Medea” starts from here. 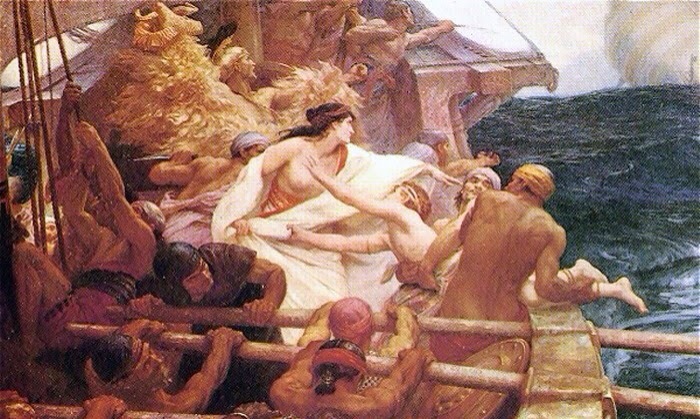 Jason and Medea along with their children reach Corinth and seek asylum. Creon, the King of Corinth was aware of the fame and the heroism of Jason. Soon Jason leaves Medea and gets married to Glauce, the daughter of the King of Corinth. Medea is shocked to learn about the development and had been sulking at the rejection for no apparent reason, except ambition, which was so obvious. Needless to say that Medea felt used and discared. The King of Corinth however, was uncomfortable with the presence of Medea whose reputation had preceded her in Corinth. He took it upon himself, to banish Medea and her children from Corinth, as Medea had made her disapproval of the marriage of Jason and Glauce public, in no uncertain terms. 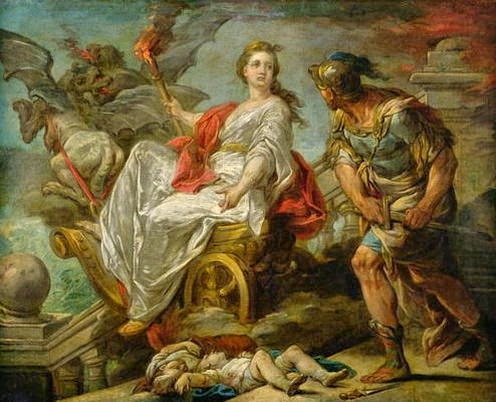 The king wanted her to leave immediately, but Medea managed to beg a day to make arrangements for the departure. The King was uncomfortable but agreed reluctantly to give her no more than the dawn of the next day. When Jason learnt about the banishment, he ended up blaming Medea and washed his hands off from being able to do anything or even intervening in the said matter. Instead he offered her money as an aid which she would need during her exile, which Medea declined. Clearly Jason had found new family and couldn’t care much for Medea. On the same day, the King of Corinth had a guest, in the childless Aegeus, King of Athens and fortunately an old friend of Medea. Medea requested him for a safe haven in Athens and in return promised him a son. Aegeus told him that since he was a state guest of Corinth, it would not be a good idea to take her with him, but if she could reach Athens, then she could be his guest and stay with him. Having secured her future, Medea set out for what she had in mind. She was not going to leave things so easy for Jason. Medea was aware that Jason had a soft corner for his children, and if he wanted to intervene, it was only for the children and not so much for Medea. She approached Jason, and reasoned with him, that it wouldn’t be easy for her to take care of the children in exile and now that she was away, couldn’t he take care of the children? As a token of her appreciation, she would send the children to Glauce. Jason found it reasonable and accepted it and was sure Glauce should have no problems with the arrangement as long as Medea was not in Corinth. To reflect her change of heart, she sent her children with gifts for Glauce. The children take with them a robe and a small crown for Glauce as gifts. Once the children return from Glauce, Medea awaits news from the palace. Glauce in the meanwhile was happy with the change of heart and was glad that Medea was leaving the next day. When the children had left, she decided to try the gifts. She put on the robe and the crown. Unknown to Glauce, the robe and the crown had poison in them. As soon as she wore the dress and put on the crown, her body was covered with poison which ate into her, and she died even before she could realise what had happened to her. When the King saw the dead body of his daughter, he tried to save her and when he realised she was dead, he embraced her in grief. The poison soon spread over to him and he too met a slow bur torturous death. When the news of the deaths in the palace reached Medea, she made her final move. She entered into the bedroom of her children and killed her own children. By now Jason had heard about the deaths of the King and Glauce. He rushed in to Medea’s room as he was sure that the soldiers of Corinth would kill his children. 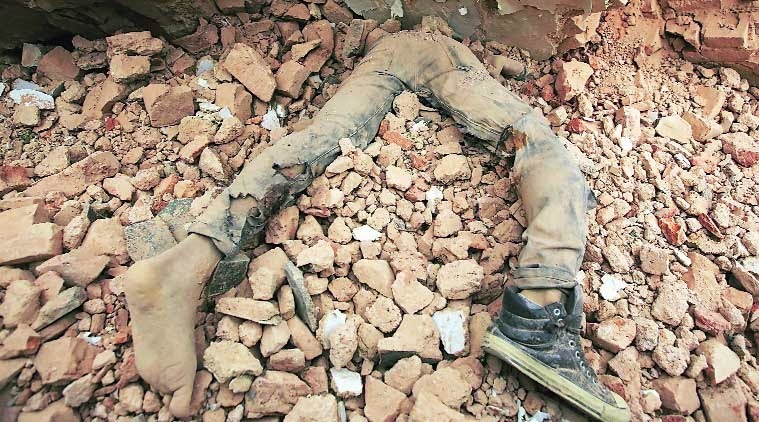 When he reached the room, he learnt that his children too had been murdered. He broke open the bedroom door of his children, only to find them missing. He could see Medea flying away in a flying chariot with the dead bodies of their children, depriving him of even the last look and the last rites of the children he so loved. Medea escaped to Athens and left Jason with neither a family nor a loved one, and deprived him of all that he craved for in life. This brings an end to the tragic life of Medea according to the play of Euripides. The story goes on to another conclusion, according to which, she flees to Athens and bears a child to the King of Athens. However, she never finds peace even there as she gets embroiled in palace intrigues and other issues, which we will skip for the time being. While Medea is the heroine of Euripides’s play, she comes across as a vengeful woman, who doesn’t hesitate to murder, all of them pre-meditated. So what was it about this woman, a villain or a victim? While the murder of an innocent brother, going against ones father and then killing her own children would be proof enough of an individual’s inherent criminality, the story goes beyond that. The story of Medea is not simply a tale of love and vengeance. It’s a beautiful drama of love and passion, at its extremities, though. It brings out the strength of passion along with the suffering of spurned love leading to the terrible consequences of vengeance. The great sorceress ends up being portrayed as a weak woman, succumbing to the emotions of love. 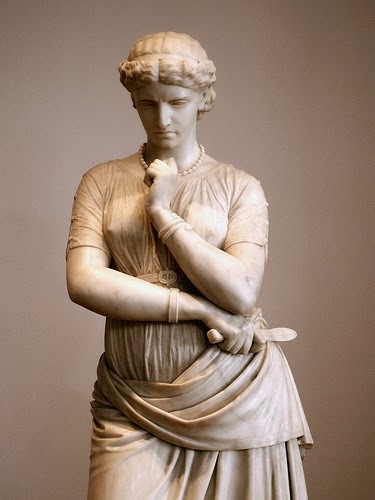 For Medea, the crime or the hurt of being spurned by the man for whom she left her home, country and reputation was much stronger than the subsequent murders that led her to a life of uncertainty, which she had foreseen and thus the plan to escape made well in advance. While many might not agree with her murdering her own children, this was dramatically expressed in the turmoil she goes through before she slays them. There was no dearth of love for the children, rather it was love, that made her kill her children, rather than they be killed by the men of the King or grow up to be vengeful creatures. Was it a mother killing her children to save them from a barbarous and torturous death by the kings soldiers or was it a mother killing her children just to deprive their father of the love of his children, is hardly debatable. Finally, she leaves with the bodies of her children depriving Jason of even the last rites of the children he so loved. However cruel this may sound; the pain that Jason goes through is the emotional victory for Medea, not that she could escape the emotional turmoil of killing her own children herself. Medea’s actions are downright despicable, but then matters of heart are never judged by the rules of mind. The inner recesses of a woman’s mind are unfathomable and the ire of a spurned woman is more so. Is a woman, just a lover or wife and finally a mother? Isn’t she an individual who has a right to express her hatred and indignation? Must her expression of indignation always be within the boundaries of expected behaviour or cultural norms? Euripides’s Medea defies these and expresses her anger and resentment in her own way, which goes against the set norms of a dutiful wife or motherly love. Her passion is intense, albeit with aberrations which are wild, but by these aberrations she either reigns or ruins wayward men! Call her a barbarian, a villain, the vile or whatever; Medea is the intense lover, in her own way who lets her passion dictate her ways and nothing else. It is important to note that the story of Medea has always been treated as a story of a woman who is vile and treacherous, while Jason is the tragic hero; it is only in Euripides’s play that Medea gets a different treatment and some semblance of respect. Medea is an interesting character from Greek mythology. Was she a villain or was she a victim, has been the debate for very long. A woman who takes lives, is a villain, and if the lives she has taken are that of her own brother and sons, then there is no doubt she is one. But even then, the question arises, was she one? Was Macbeth a villain or was he a victim of circumstances? Was Macbeth a victim of his ambitions, fuelled by his wife, and thus a tragic villain? Was Othello a victim of suspicion and jealousy or was he inherently evil? All such characters had a fault in their fate and Medea was no exception. While Greek mythology in general is not quite appreciative about Medea, Euripides in his play 'Medea’, tries to portray Medea as a tragic heroine. This article is based on the play by Euripides. Before we refer to the play, a brief background is necessary. The story begins with Jason (of the Argonauts fame). Jason was the designated King of Iolcus, in Greece, but since he was too young to rule, he was sent to be educated by Chiron, the centaur. In his place, his uncle Pelias ruled the kingdom. When Jason returned, Pelias was not keen to part with power. Pelias asked Jason, as to what could be done to get rid of a person, who was not wanted. Jason answered that the person should be sent to get the Golden Fleece. Pelias promptly asked Jason to get the Golden Fleece for him and Jason decided to accept the challenge. Jason and the Golden Fleece. National Archaeological Museum. Naples. Soon Jason sets out on the expedition with a selection of fifty heroes of the times (Hercules and Orpheus being among them), in a ship called the Argo, considered to be the first large ship and a prototype of naval ships to come. 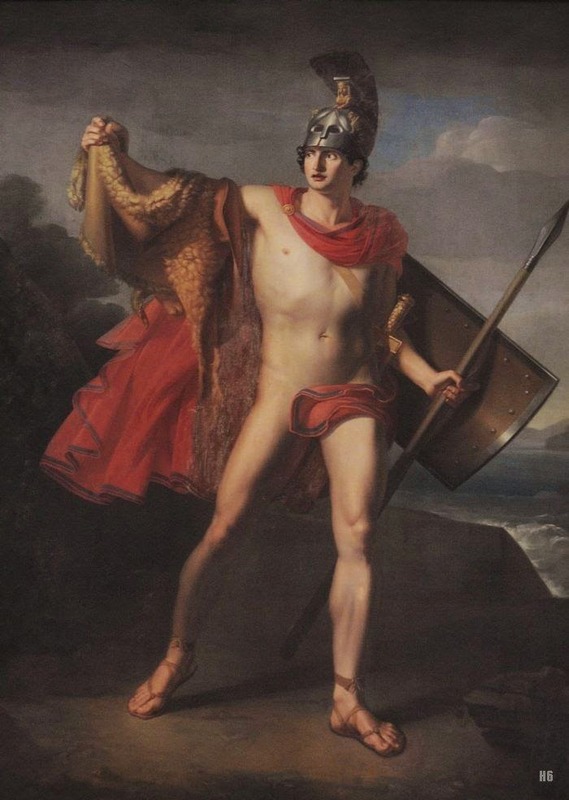 After many adventures, and with the help from Goddess Hera, Jason reached Colchis, the land where the Golden Fleece was supposed to be guarded by a dragon. At Colchis, they were greeted by Aeetes, the King of Colchis and his daughter Medea. When Aeetes asked Jason the cause of their arrival, Jason said that he had been entrusted with the task of bringing the Golden Fleece and for that he was willing to render any service that the King might ask. While this angered the King to no end, he decided not to react harshly and set his terms for handing over the Fleece. The King said that he would hand over the Fleece to Jason, only if he could yoke two monstrous and fire-breathing bulls and plough the land with them, to sow some dragons teeth, from which would spring armed warriors, who had to be then killed by Jason. Jason would then have to overcome the dragon, which stood guard to the fleece. If Jason achieved all this, then the fleece would be his. Hera, in the meanwhile had instructed the god of love, to make Medea fall in love with Jason, as she was rumoured to have magical powers which would be needed by Jason to achieve the tasks given to him. Jason accepted the challenge and decided to seek help from Medea. When the two met, Medea who had already been besotted by Jason’s looks was now madly in love with him. She decided to help him and to cut short a long story; Jason achieved all that he had been asked to do. When the King learnt about his daughter’s betrayal, he was angry and chased a fleeing Jason and Medea, since the latter had no choice but to flee with Jason. It is said that during the conflict, Medea’s brother was killed and according to a version, Medea cut her brother into pieces and flung them all over the sea, so that her father would stay back to collect all the pieces for a respectable funeral. This gave the fleeing Argonauts time and soon they were way ahead. Jason got the Golden Fleece and Medea lost her country and family. Soon Medea and Jason reached their country but Jason’s uncle, Pelias was still not willing to part with the throne. Medea used her magical powers once again. She told the daughters of Pelias that she had the power to restore the youth of their old father. 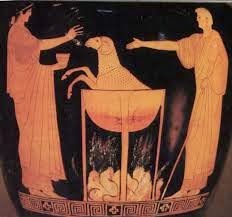 She demonstrated it by cutting a ram to pieces and putting it in a cauldron with magical herbs and out came a lamb. The unsuspecting girls were impressed by this and they decided to rejuvenate their father. They killed their father and cut him into pieces and put them in the cauldron, but this time Medea did not use her magical powers to bring Pelias back to life. This however did not go down well with people and once again Jason and Medea along with their two children, had to flee and reached Corinth seeking asylum. 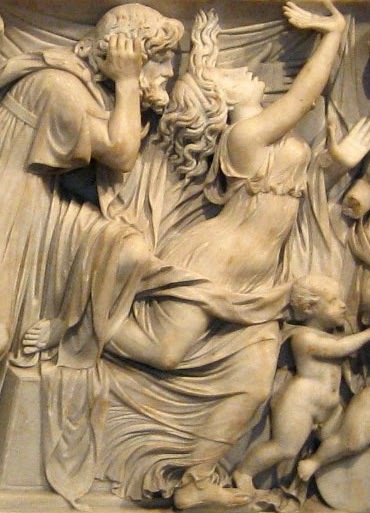 Jason and Medea along with their children reach Corinth and seek asylum. At Corinth, the King of Corinth was aware of the fame and the heroism of Jason. Soon Jason leaves Medea and gets married to Glauce, the daughter of the King of Corinth. Medea is shocked to learn about the development and had been sulking at the rejection for no apparent reason, except ambition, which was so obvious. Needless to say that Medea felt used and thrown away.